eMP3 Downloads is an online website to download various music into MP3 format. Users can find songs based on songs’ title, movie names, artists, and so on. 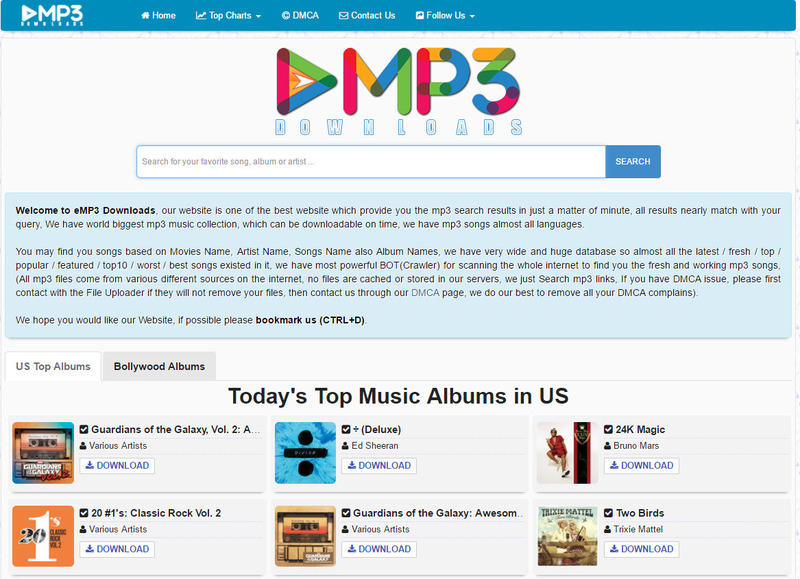 This site includes songs from the US and Bollywood top albums. "I like that I downloaded for you for free without any issues so i can play it whenever im commuting. Im not even the biggest fan of fifty shades but their soundtrack be bomb af !" "What can be said other than this being just another source for MP3 downloads. Not much different than any other source. Just choose a title, pay, and download." "Website interface is very user-friendly no complicated search bars and everything. I was able to download a non-stop drake playlist from here at the size of less than 10mb. Pretty compressed but the quality is still okay. Play and download buttons do not have pop-out ads. Kudos to devs!" "This website is a must have!" "eMP3 Downloads is an excellent way to find the songs you are looking for. It has a great search engine and a variety of ways to search for the song you are looking for. The best aspect of this site and service is the fact that it is free!" "I've tried downloading music here and so far no suspicious viruses or malware on my downloaded files so I must say this is a pretty decent website." "eMP3 downloads are a great place to download quality English songs." "I like www.songdew.com for new songs "
"This is an underrated website. The interface is pretty user-friendly, download button is easily seeen right on the landing page. Classic bollywoods are also available in here. 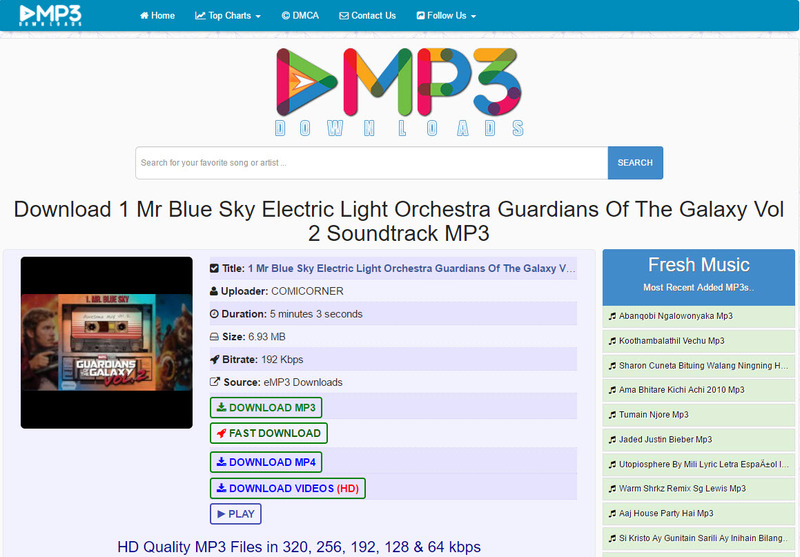 :D "
"eMP3 is your basic free mp3 downloader. There are better, there are worse, it's really jsut an average resource for mp3 downloads. On the plus side it's really small, on the downside, there are far better options. If you're looking for something quick and small though, look no further." "This is a great source to download lots of songs, including those from the movie Raabta"
"Am Indian living in America so it is pretty hard for me to find websites where i can download Bollywood songs for free. But after i found out about this I finally can download and find songs easily. " "What I like about eMP3 is that not only I can download mp3s for Bieber's songs but mp4s also! The music videos are lit and I love watching Bieber sing OMG he's so handsome I can melt!" "So easy to find all of my Justin's songs for download!" "Not a reliable website. Sites like these are honeypots for malicious ads and trojans. You'd be much better off finding music uploaded to youtube and using a browser extension to just download that." "I like how emp3 also allows me to download music videos of Enrique coz omg look at this handsome face and his moves! How I love watching him while listening to him." "eMP3 is a solid MP3 website that has been around for a while. They always give you the option to download standard quality music or high quality music and they set themselves apart by not being another typical YouTube converter website. Recently has lowered in quality due to some of their ads." "they have so many available music even non-english ones. It's also easy to look for what to download because the top releases are already ordered in the site. I don't have to search and navigate to keep myself updated with the music." "eMP3 sometimes bugs that the songs I donwloaded weren't the songs I looked fgor even if I specifically specified it would be Selena songs for example. This website needs more fixing." "Could have been a good resource but I didn't like how it prompted itself to allow notifcations on my browser before it would allow anything to be downloaded. Such dirty tactics." "A pretty convenient site! One of my favorite songs of Demi is Confident! Lovatics forever!" "YAY for free downloads! Thanks to this website i am able to download Ariana Grande's for free and also in good quality. " "This service claims that it provides access to millions of music files, but that's a blatant lie. Out of 100 songs I was interested in downloading, I could only find 15. The format and display looks cheap any ugly, and navigation is incredibly confusing. I'd recommend this to no one. In fact, you'd be better off paying for your music!" "Seems like a good choice but honestly, I do not know the validity of the site or if it is legitimate or not. I am always wary of sites like these. Is it a clean download or do you get all sorts of malware with it?" "This only gives you one website to download songs and it may not be the best "
"I'm always up for website that offer free stuff, though I'm not always sure how legal they are. This is another example. I was able to download a lot of files from this website to listen to, but I don't know if doing so is actually legal." "eMP3 Downloads is a mess of a site. There's very little sensible organization and there just aren't many appealing files to download. Peek around if you want but I would't expect much." "It looks like this allows you to download mp3s. It does not however offer mp4 downloading as far as I am aware. " "This is a huge database of music, and has some new and alternative artists. It's easy to put on a zip drive and transfer to the phone as well, making a playlist at the touch of a button. This is a fantastic site, although I'm not sure how long it will be up, as most of these sites get shut down for copyright infringement." "Feeling lucky? Don't care if musicians get paid? Then this might be the site for you. It's not for me though. The home page is clearly not written by a native English speaker, so no warm fuzzies there. You couldn't pay me to download links this site provides. Lord knows what it might do to my computer ... or my security."